South Yorkshire athletes are medal hunting across the Pennines this weekend. The Northern Senior and Junior (Under 20) Championships take place today and tomorrow at SportCity, Manchester with several of our travelling competitors expected to be among the honours. Ransford Anthony (Doncaster AC) defends his title in the 100 metres whilst Tim Burn (City of Sheffield and Dearne) should be prominent in the 400 metres. Luke Cutts (Sheffield) should have no problem in winning the pole vault. Liam Ramsay (Sheffield) is in that event along with the long jump, where he faces his team mate Daniel Gardiner, and the 110 metres hurdles. Also from Sheffield, Joe Dunderdale is favourite for the javelin whilst his brother Haran could make it a family double by winning the 3000 metres steeplechase. 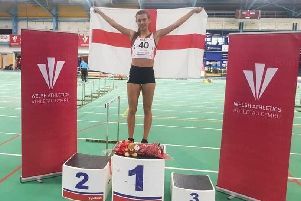 In the women’s events Sheffield based international Louise Bloor (Trafford) is listed for the 100 and 200 metres and City of Sheffield duo Zara Hohn and Kelly Clark contest the 100 hurdles. In the junior men’s section Rotherham’s Lee Thompson defends his 400 metres title whilst Adam Hague (City of Sheffield) faces his junior international team mate Harry Coppell (Wigan) in the pole vault. In the junior women’s section Sheffield’s Kristie Edwards is favourite for a sprint double. In the 100 she faces Chesterfield’s Alicia Barrett whose sister Ella goes for the 200 metres. Alicia Barrett is also in the 100 hurdles. In the field events Barnsley’s Toni Buckingham should do well in the shot. The South Yorks Schools Championships take place at Woodbourn Road, Sheffield today. Sheffield are invariably the strongest region. In the senior boys events they have Joe Hobson listed for both high and long jump, Oscar Bryce for the hammer whilst middle distance runners Connor Milnes (1500) and Jonathon Shields (steeplechase) should do well. In the senior girls section Charlotte Slack (400 and 800) and Eleanor Curran (1500) should be prominent. Cameron Bell is in the intermediate 800 metres for Sheffield and Alfie Manthorpe goes for the 3000 metres. The intermediate girls section is strong for Sheffield with Emily Simpson in the 800 and Amelia Lancaster the 3000 metres. Brodie Jones does the 200; her sister Bronte is in shot and discus. At junior level Jacques Etia does both the 100 and 200 and Elizabeth Wilkinson goes for the 800. Places are at stake in the South Yorkshire team to compete in the English Schools Championships next month. The long programme gets underway at 9:30.